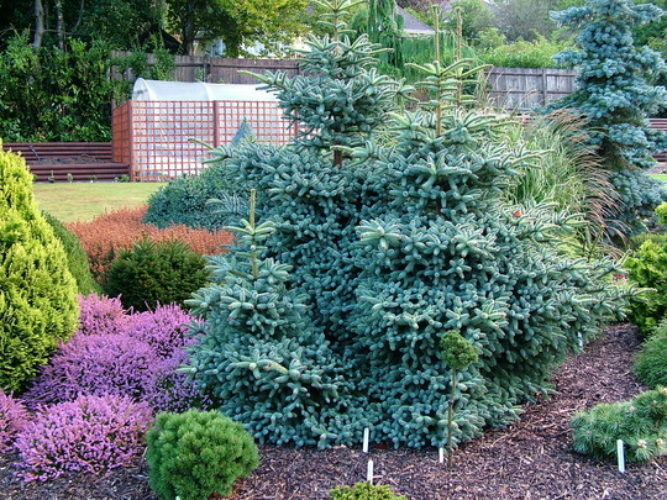 Abies pinsapo 'Horstmann' is an exceptional dwarf- to intermediate-growing selection of Spanish fir with typical foliage structure that is a vivid Blue in color. While young plants are often seen with globose or spreading globose structure, a plant approaching maturity will develop a terminal leader eventually assuming a dense pyramidal form. After 10 years of growth a mature specimen will measure 3 feet (1 m) tall and and 2 feet (0.6 m) wide and will likely accelerate from that point unless controlled by careful pruning. This cultivar originated in the mid 1970s as a witch's broom found on a specimen of Abies pinsapo 'Glauca' by Günter Horstmann of Schneverdingen, Germany and released into the nursery trade through his family's namesake nursery. To this day it is often seen listed under the names, 'Nana' and 'Horstmann's Nana' which, according to the ICBN, are illegitimate names for any cultivars named after 1959. Abies pinsapo 'Horstmann' — a spectacular specimen in a private garden in the United Kingdom.